A probiotic supplement containing two live bacterial species (Lactobacillus acidophillus and Enterococcus faecium), an extract of the green alga Chlorella pyrenoidosa, and prebiotic inulin. It vitalises the colon microflora, potentiates the immune system, and reduces the natural toxic burden by reducing putrefactive processes in the bowel. The product has anti-inflammatory effects in the bowel and it calm down irritated mucosa. It attenuates diarrhoea and hemorrhagic intestinal conditions. Suitable for all animal species, particularly for growing young and animals fed with industrial foodstuffs. - For conditions affecting the gastrointestinal tract [Regavet]. - For flatulence and gastrointestinal problems [Regavet, Kingvet]. - For foul and paste-like diarrhoeas [Regavet, Cytovet]. - For foul breath [Regavet]. - Effective prevention in feeding with granules and foodstuffs containing preservatives. - It enhances the overall immunity [Imunovet, Virovet]. - For the prevention of conditions associated with the old age – hair greying, joint degeneration, kidney failure [Regavet]. - For perverse appetite (e.g. consumption of excrements) [Etovet]. - For hair-staining discharge from the eyes [Regavet]. In 1 capsule: Chlorella pyrenoidosa (250mg), gelatine, inulin (40mg), lactic bacteria Lactobacillus acidophilus and Enterococcus faecium (10mg). Animals over 50kg: 1 to 2 capsules for every 50kg of weight twice or three times a day. To facilitate swallowing it is advisable to dampen the capsule with water or cover it with fat before administration. May be administered in titbits. Where problems with intake are experienced, it is possible to open the capsule by pulling it gently apart and to mix its contents ideally with foodstuff or titbits. It is recommended to use the product within three months of opening. 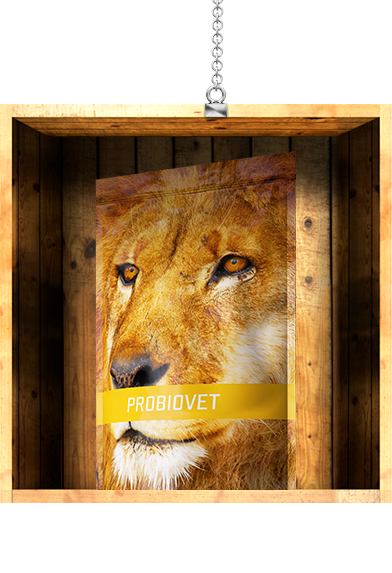 I use Probiovet to improve digestion. The product composition effectively helps to combat diarrhoea and improves the bacterial colonisation of the intestine. Good digestion means also a proper function of the immune system.